Madame Bovary – Joyce's mystery and fiction book reviews with some non-fiction too! 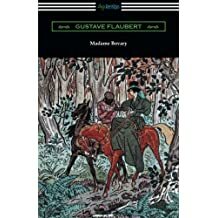 This week in my class on Adultery in 19th Century Literature, we had our first discussion of Gustave Flaubert’s great novel of realism. I had read this novel when in my twenties and was curious to see what I would think in rereading it now. I will share some of my reactions next time. Emma Bovary, a farmer’s daughter, has built her life on dreams of being the heroine of her own romantic story. Marriage to Charles, a country doctor, and life in a provincial town leave her stultified and looking for a great passion. Emma flirts first with Leon and later with Rodolphe as her marriage bores her and does not meet her needs. Sadly, however, Emma is naive and susceptible. She dreams and spends money that she does not have as she tries to deal with what she sees as life’s disappointments. Next week, I will learn more about the book and her fate. Questions to think about in reading the novel…what was it like to be a woman in a time when there were few choices? Was Emma a good mother? Why can she and Charles not understand one another? Does Charles, who loves Emma, have any clue to her inner life? What does it mean that there are different standards for men and women? If you have never read Madame Bovary, I recommend it. If you have, please share your thoughts about this novel.